The U.S. Treasury estimates that the Production Tax Credit will cost taxpayers $40.12 billion from 2018 to 2027, making it the most expensive energy subsidy under current tax law. These tax credits fundamentally distort markets and strain the grid in ways that are economically unsustainable. Backup costs (i.e. the costs of maintaining backup electricity 24/7 to compensate for wind and solar’s intermittency) are not included in estimations of the cost of wind and solar power, leading to gross underestimation of the costs of these energy sources. Countries like Germany, Great Britain and Spain have invested in wind and solar power only to have higher residential electricity prices than the United States. If wind and solar truly make sense, the free market will support them without the need for subsidies and mandates. For decades, Congress has provided lucrative federal tax subsidies to the wind and solar industries in order to establish those industries in the United States. Despite the fact that wind and solar energy now provide 8 percent of the country’s electricity, the 116th Congress is again looking to extend their tax credits. The Production Tax Credit for wind and the Investment Tax Credit for solar are federal incentives that are paid for by the American taxpayer. The U.S. Treasury estimates that the Production Tax Credit will cost taxpayers $40.12 billion from 2018 to 2027, making it the most expensive energy subsidy under current tax law. Not only are taxpayers subsidizing these industries, but American consumers are also paying more for electricity. While fossil fuel prices have been declining and electricity demand has been relatively flat, electricity prices have increased by 56 percent between 2000 and 2018, with the largest increases coming from many of the states that promoted the establishment of wind and solar energy through state subsidies and mandates for their production. It is time for Congress to pay attention to consumers’ pocketbooks and rethink tax credit extensions for these industries. Making more expensive energy choices directly affects household budgets and our international competitiveness. The history of federal wind tax credits goes back more than 25 years. In 1992, Congress passed The Energy Policy Act that established the Production Tax Credit (PTC) for wind energy, providing a tax credit of 2.3 cents per kilowatt hour of wind energy produced for the next 10 years of the facility’s operation. The PTC has been renewed numerous times, most recently by the Consolidated Appropriations Act of 2016 (H.R. 2029, Sec. 301) in December 2015 and the Bipartisan Budget Act of 2018 (H.R. 1892 Sec. 40409). Wind facilities commencing construction by December 31, 2019, can qualify for the inflation–adjusted credit. The facilities do not need to be producing energy by 2020; they only need to be under construction. The value of the credit, however, was phased down for 2017, 2018 and 2019 by 20 percent, 40 percent, and 60 percent, respectively. The Investment Tax Credit (ITC) for solar energy provides a 30 percent tax credit on the investment of a qualifying solar facility. Meaning, taxpayers literally purchase 30 percent of every solar array on roofs or in industrial solar farms. Because 80 percent of our solar panels originate overseas, U.S. taxpayers are contributing 24 percent of the cost going overseas. It would be akin to taxpayers buying three of every ten gallons of gasoline that consumers purchase, at a time when we were importing 80 percent of our gasoline. Similar to the PTC, the ITC was amended by The Consolidated Appropriations Act of 2015, which extended the expiration date, but also introduced a step-down in the value of the credit to 26 percent in 2020, 22 percent in 2021, and a permanent 10 percent in 2022 and beyond. In 2022 and to eternity under existing law, taxpayers will buy one in ten of every solar panel installed. The Energy Information Administration’s Annual Energy Outlook 2019 expects wind and solar generation to reach almost double their current market share by 2025, increasing from 8 percent today to 14 percent by 2025, and supply a combined 23 percent share by 2050. These shares are based on the current phase-down of the tax credits described above. Solar generation growth continues beyond the phase-down of the solar Investment Tax Credit after 2024 because EIA assumes the costs for solar continue to fall faster than for other sources. That means wind and solar generation together are expected to supply more power in 2050 than either coal or nuclear power. Natural gas, whose prices are forecast to remain low, is the only resource that is expected to supply more power than wind and solar in 2050. Natural gas combined cycle technology has double the capacity factor of wind and over three times the capacity factor of solar power, consuming a lot less land area than either of these intermittent renewable technologies. The wind PTC can actually cause wholesale generating prices to drop below zero and compel other technologies to accept those prices. Unlike the stable and predictable price of electricity at the retail level, market prices for wholesale electricity can fluctuate widely throughout the day—usually referred to as on-peak and off-peak prices—and across seasons. For example, wholesale prices tend to range between $30 and $50 per megawatt-hour but can drop into the negative range or spike well above $500 per megawatt-hour. Wind producers are paid the equivalent of $35 per megawatt-hour in Production Tax Credit subsidies (pre-tax income of the $23 per megawatt credit), so a wind producer can still profit while paying the grid to take its electricity, producing negative prices. When the price becomes negative, electric generators are actually paying the grid to take their electricity. Fundamentally, negative wholesale prices send a distress signal telling markets that the supply and demand balance on the grid is economically unsustainable and suppliers need to reduce their output. But, these market signals do not apply to wind since they are paid by taxpayers to produce electricity whether it is needed or not. Negative prices generally occur more often in markets with large amounts of nuclear, hydro, and/or wind generation. That is because each of these technologies has an incentive to continue operating even when its facilities are temporarily paying the grid to take their power. Nuclear plants are designed to run at full output and not “ramp” up and down, making them reliable but inflexible. In times of very low demand, nuclear plants will take negative prices rather than go through the long and expensive process of lowering their output. Similarly, hydroelectric plants sometimes take negative prices in power markets because they are forced to run in order to comply with environmental requirements that force them to release water, regardless of whether the electricity is needed. Also increasing the cost of wind and solar technologies are the additional transmission lines that are needed to get the power from remote areas where wind and solar resources are plentiful to main transmission lines that deliver power to the public. Consumers pay in their utility bills to construct transmission lines for intermittent sources while existing sources with higher capacity factors lay fallow because of the mandates and subsidies of renewable sources. In North Dakota, electricity prices increased 32 percent while electricity from solar and wind grew from nine to 27 percent between 2009 and 2017. In South Dakota, electricity prices increased 36 percent while electricity from solar and wind grew from five to 30 percent between 2009 and 2017. In Kansas, electricity prices increased 33 percent while electricity from solar and wind grew from six to 36 percent between 2009 and 2017. In Iowa, electricity prices increased 18 percent while electricity from solar and wind grew from 14 to 37 percent between 2009 and 2017. In Oklahoma, electricity prices increased 18 percent while electricity from solar and wind grew from four to 32 percent between 2009 and 2017. These increases occurred even as the relative cost of natural gas and coal declined. European countries also have seen increasing electricity prices as they moved into wind and solar energy. Germany’s residential electricity rates have doubled since 2000 due largely to Germany’s Energiewende—a government-mandated transition from nuclear and coal to wind and solar power. In Britain, the price of residential electricity increased by 27 percent in just a decade. Germany and Britain both have heavily invested in wind power and have higher residential electricity prices than the United States—200 percent to 300 percent higher. Spain’s electricity prices were below the European average in 2009, but today they are among the highest in Europe, forcing them to cut back subsidies to wind and solar technologies. Escalating electricity prices are regressive—poorer people pay a much higher proportion of their incomes heating and cooling their houses than do richer people. As a result, these European countries have experienced an increase in energy poverty, and increasing signs of unrest related to energy pricing, such as the Gilets Jaunes (yellow vests) movement in France. Fear of climate change and the resulting Paris Accord has prompted countries to invest in wind and solar energy. Countries are heavily subsidizing these technologies, while finding that their investment in them is causing increases in electricity prices, pushing people into energy poverty, and costing government budgets billions in subsidies. While the benefits have been minor at best, the cost has been huge. Will the U.S. Congress and state governments realize that the cost of the subsidies and mandates outweigh the benefits and allow electricity markets to evolve freely? If wind and solar truly make sense, the free market will support them without the need for subsidies and mandates. Department of Energy. “Renewable Electricity Production Tax Credit (PTC).” Accessed March 06, 2019. https://www.energy.gov/savings/renewable-electricity-production-tax-credit-ptc. “Business Energy Investment Tax Credit (ITC).” Department of Energy. Accessed March 06, 2019. https://www.energy.gov/savings/business-energy-investment-tax-credit-itc. Cummins, Eleanor. “The Price of Solar Panels Just Went Up-here’s What That Means for You.” Popular Science. June 08, 2018. Accessed March 06, 2019. https://www.popsci.com/solar-panel-tariff-effects. U.S. Energy Information Administration. Office of Energy Analysis. 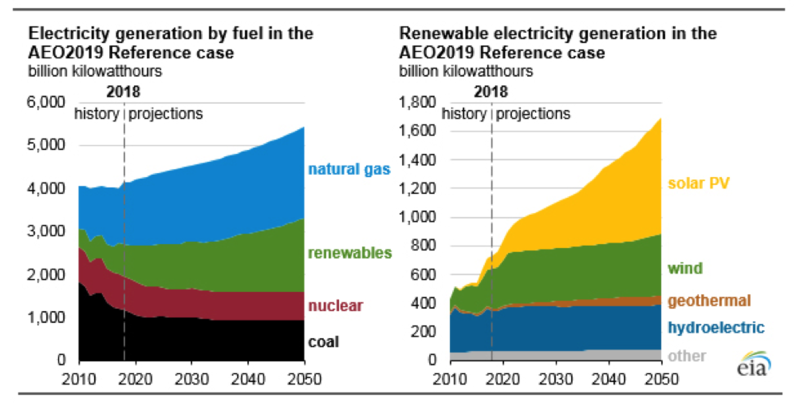 Annual Energy Outlook 2019 with Projections to 2050. Washington D.C.: U.S. Department of Energy, 2019. “U.S. Energy Information Administration – EIA – Independent Statistics and Analysis.” Factors Affecting Gasoline Prices – Energy Explained, Your Guide To Understanding Energy – Energy Information Administration. May 1, 2012. Accessed March 06, 2019. https://www.eia.gov/todayinenergy/detail.php?id=6070. Giberson, Michael, PhD. Assessing Wind Power Cost Estimates. Report. Center for Energy Commerce, Texas Tech University. Washington D.C.: Institute for Energy Research, 2013. Shellenberger, Michael. “Yes, Solar And Wind Really Do Increase Electricity Prices — And For Inherently Physical Reasons.” Forbes. September 06, 2018. Accessed March 06, 2019. https://www.forbes.com/sites/michaelshellenberger/2018/04/25/yes-solar-and-wind-really-do-increase-electricity-prices-and-for-inherently-physical-reasons/#4d17f05117e8. The Mirage of a “Rational Green New Deal”: Comment on Holman Jenkins Jr.